Walnuts and cranberries are a wonderful holiday flavor pairing. 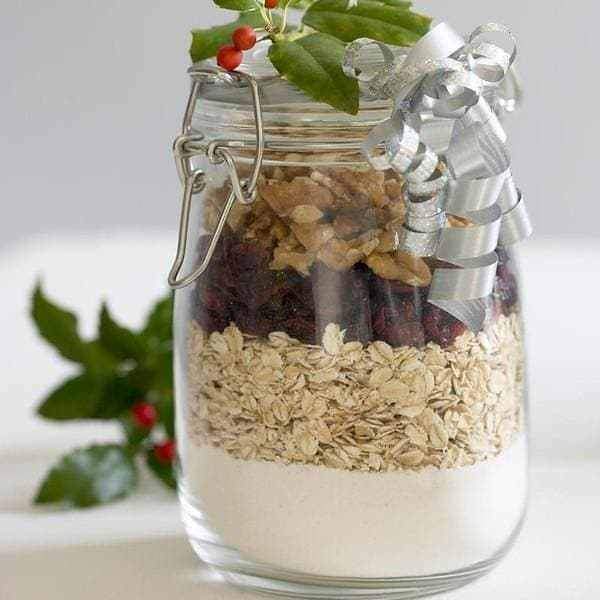 Give this wholesome cookie mix gift jar as a fun (and delicious) gift this season. In a glass jar, layer the dry ingredients in the order they are listed. On a gift tag or card, list the additional ingredients and the recipe. 1 jar of "cookie mix"
In large mixing bowl, with electric mixer, cream butter and brown sugar until fluffy; beat in the vanilla. Next, stir in the crushed pineapple. In separate bowl, mix together the contents of the "cookie mix" from the jar until well combined. Add the dry ingredients into the pineapple mixture and stir until well combined. Drop by rounded spoonsful onto greased baking sheet. Bake in 350 degrees F oven for 12 to 15 minutes or until golden brown. Cool on baking rack. Recipe and photo credit: California Walnuts.